Australian Cypress Stair Parts - Unfinished. All stair parts are made-to-order. Allow 3-4 weeks. Contact us to buy with your order. Minimum order 3 treads with flooring or lumber. Treads with bullnose "returns" at end(s), and custom lengths & widths are by arrangement. Contact us to discuss. 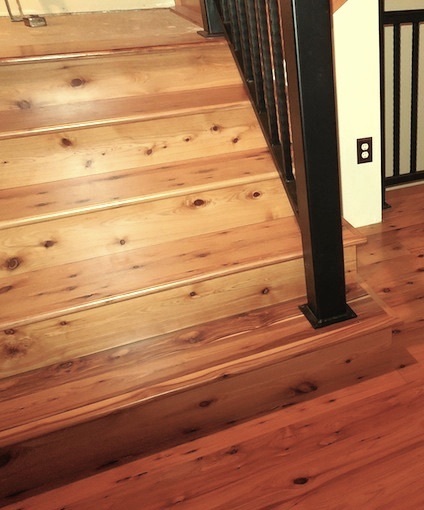 Australian Cypress stair treads - installed. Minimum order 3 risers with flooring or lumber. Custom lengths are by arrangement at the time of flooring or lumber order. Contact us to discuss. NOTE: Risers are for available only with treads and/or flooring or lumber. Stair Nose - unfinished Australian Cypress, with rebate on the underside to fit with flooring. Must be bought with a flooring, lumber and/or treads+risers order. No stand-alone stair nose orders are possible. 5-1/4" x 3/4": $8.28 / lineal ft.
3-1/4" x 3/4": $8.08 / lineal ft. Maximum length 7 lineal ft (due to risk of damage during shipping). Please check the lengths you need and if a span you need to cover is more than 7 lft, figure out the best shorter cuts that will work for your installation and let us know. Must be bought with a flooring or lumber order. No stand-alone molding orders are possible. Colonial baseboard: 3-½" x ⅝", $8.98 / lft. Crown molding: $8.98 / lft. T mold: $7.49 / lft. Reducer: 2-¼", $5.98 / lft. Quarter round: $1.98 / lft.